Vicki Harris heads to the bucket for Warsaw Saturday in the LaPorte Regional. The Tigers lost 48-36 to No. 9 Merrillville in a semifinal game. LAPORTE – There was no denying the effort of the Warsaw girls basketball team for the full 32 minutes on Saturday. The Tigers though were denied in their quest to extend their postseason run by a pair of tough quarters. Warsaw could not overcome a pair of slow starts in dropping a 48-36 final to No. 9 Merrillville in the second semifinal game of the Class 4-A LaPorte Regional. The Tigers finish their season at 15-11. The Pirates (20-7) advanced to the regional final Saturday night to face No. 7 Lake Central (22-3). Lake Central topped No. 5 Penn 49-45 in the first semifinal game on Saturday morning. The Kingsmen, state runner-up last year, finish the season at 22-5 with a pair of losses to Lake Central and one to Merrillville. Merrillville beat Lake Central 58-49 in the regional title game Saturday night. The Pirates, who lost to Lake Central 55-41 back in December, will play Homestead in the semi state next Saturday at either Crown Point or Warsaw. The Tigers outscored the quick and athletic Pirates 30-24 in the second and fourth quarters combined. The trouble for Warsaw was the start of the game and the start of the second half. The Tigers fell behind 13-1 to open the game and then were outscored 11-2 in the pivotal third period of play after rallying to get back into the contest by halftime. The combination of turnovers against the aggressive Pirates and poor shooting played the Tigers in the tough two stanzas. Warsaw shot just 3-19 in the opening half and had nine turnovers. The Tigers did not make a field goal in the third quarter and had 10 turnovers in the frame. Jodie Carlson makes a move for Warsaw. “My fear today was that we would come out and play a little scared and that’s what happened in that first quarter,” said Warasw coach Michelle Harter. “We got playing too fast, did not attack and their athleticism caused turnovers. “It’s hard to simulate that stuff (Merrillville’s quickness and athleticism) in practice. You can try, but you really can’t do it. Our offense just stalled. Warsaw, which beat the Pirates in the regional final in 2013, scored its only basket of the opening period with 33 seconds left on a drive by sophomore Dayton Groninger. Merrillville star Victoria Gaines scored seven points in the opening period to set the tone. The 6-1 senior forward, who has signed to play at Michigan State, led the Pirates on the day with 14 points. The Tigers used the free throw line to get back in the game in the second quarter. Warsaw hit seven free throws in the period, four by Vicki Harris, to pull within 19-15. The third period was all Pirates as they took command en route to their 13th win in a row. Sophomore Jasmine Wright hit a pair of treys in the stanza as Merrillville built a 30-17 lead. The only points in the quarter for Warsaw were two fee throws by Groninger. Warsaw showed its heart in the final frame. The Tigers, led by sophomores Madi Graham and Groninger, opened the period with a 7-0 run to get within 30-24 on a pair of fee throws by Graham with 7:04 to play. The Pirates, who hit 10 free throws in the final stanza, bumped the lead back to 35-24. Warsaw got back within 35-29 with 4:00 to play on a triple by Graham, but that was as close as they would get. Madi Graham hits the deck as the ball goes flying out of bounds. Groninger led Warsaw with 11 points to go with eight rebounds. Graham and Harris each ahd eight points, while Pam Miller had four and 11 rebounds. Jodie Carlson and Page Desenberg each had two points and Erin Clemens one. Clemens also had nine rebounds. Warsaw simply could not finish shots. The Tigers finished 9-40 from the field and had a big 37-28 rebounding edge, which included 17 offensive caroms. Warsaw finished with 21 turnovers. Gaines had 14 points and seven rebounds to pace the Pirates. Wright had 12 points and senior Jaz Talley 11. Merrillville shot 14-37 from the field for the game and had 14 turnovers. The game marked the end of the line for Warsaw seniors Miller, Harris, Carlson and Clemens. Harris, Miller and Clemens all started on Saturday. 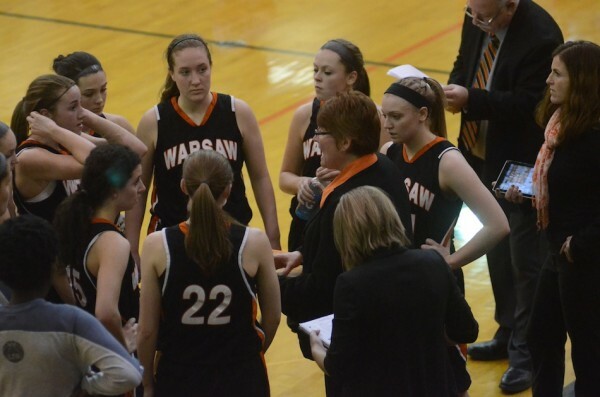 Coach Michelle Harter gives instructions to her Warsaw team during a timeout in the fourth quarter Saturday.